Sign up to receive the HBHW newsletter every other week. I'll also send you my family budget report as a thank you for joining. Your information will never be rented, shared or sold. You may unsubscribe at any time. 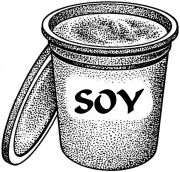 Cultured soy milk is the official name of soy yogurt. Yogurt is a term that legally can only be applied to milk products. Since soy is not a milk product, it can't officially be called yogurt. I call it yogurt anyway. I am not bound by legal or manufacturing regulations. I am just a housewife with several hungry children. Hungry children will not be bothered with the term "Cultured Soy Milk". They just say yogurt and leave it at that. If you've ever made dairy yogurt, then you already know how to make soy yogurt. Soy milk and store-bought yogurt are combined in a large jar or bowl. The mixture is whisked well, to make sure the prepared yogurt is well combined with the soy milk. Then the entire mixture is placed in a warm spot for 4 to 8 hours, or until the yogurt is thickened and set. When you are at the store looking for starter yogurt be sure to read the package label. You need starter yogurt that has "active cultures"; this is vitally important. Active culture is a scientific name for friendly bacteria. The friendly bacteria are the critters who do the job of thickening your yogurt and giving it that lovely tangy flavor. If the starter-yogurt you buy doesn't have active cultures, then it can't turn your soy milk into soy yogurt. My local Natural Foods Co-op has cultured soy milk in the refrigerator section, not far from the dairy yogurt. The brand I buy is called Whole Soy. It contains lots of healthy active cultures and does a beautiful job of making yogurt. If you are unable to find soy yogurt to use a starter, then you can use dairy yogurt instead. It's best to choose a plain flavor either way. I buy a small cup (6 to 8 oz) of soy yogurt and use about half of it for each batch of yogurt I make. Every cook develops his or her own method of culturing yogurt. Don't think that there is only one right way, because there isn't. We all have to adapt to our own cooking conditions and ingredient situations. Making yogurt at home is not 100% fool proof. Everyone has the occasional failed batch. This is normal. I've been making yogurt several times a month for close to 10 years and I still have batches that fail. There are steps you can take to minimize the failure rate though. First, be sure to always use clean utensils. Competing bacteria can hide in whisk wires, on the rims of jars and lots of other sneaky places. Make sure all of your spoons, jars, bowls and whisks are clean before you begin. Some folks suggest that all of the utensils should be sterilized. You could do this by dipping everything in boiling water for a few moments and then allowing them to cool. I don't bother with sterilization because I am lazy. If you want to make sure your yogurt is perfect every time, sterilization would be an option. Next, make certain that your starter yogurt has active cultures. If there aren't any live cultures in your starter yogurt, then nothing will happen. Read the label to be sure. If you are using fresh, homemade soy milk, allow it to cool down to lukewarm before introducing the culture. Hot soy milk will kill the friendly bacteria. Warm soy milk will make the bacteria very happy and more friendly. If you are using an aseptic box of soy milk, you can use it at room temperature, straight from the box. If you are using refrigerated soy milk, then you may want to heat it briefly on the stove or in the microwave, to take the chill off of it. I don't always do this, and my yogurt still turns out just fine, although it does take a little longer to set. Combine the soy milk and starter yogurt in a quart-sized canning jar or a casserole with a lid or a large resealable plastic container. Use a clean whisk to beat the mixture until the yogurt is well liquefied into soy milk. Now, place a lid on the container and place it in a warm spot. You want a constant temperature of about 100ï¿½. A little warmer is fine and a little cooler is fine. I have found that anywhere from 85ï¿½ to about 120ï¿½ will work just fine. Any warmer than 120ï¿½ is too hot. The bacteria will die off because of the heat and you will not have good results. I culture my yogurt in my oven overnight. I've had the most consistent results this way. I turn my dial half-way between OFF and 200ï¿½, or at approximately 100ï¿½. Then I shut the door to the oven and let the yogurt sit overnight. In the morning I have perfect yogurt. If your oven will not set at 100ï¿½ then you can try turning it on 200ï¿½ for two minutes, and then turning it off. About 4 hours later check the yogurt. If it isn't set yet then turn the oven on 200ï¿½ for two minutes again to rewarm the oven. Allow the yogurt to set another 2 to 4 hours or until it is thick. Depending on your oven's insulation and the mean temperature of your kitchen you may need to rewarm the oven more frequently, or less frequently. Be sure not to leave the oven on, or your yogurt will be cooked not cultured. Another method of incubation involves a heating pad and a large bowl or pot. Place a towel over the heating pad and set the heating pad on low. Place the prepared soy milk on top of the heating pad. Invert a large bowl or pot over the whole contraption, rather like a tent. This will keep the heat focused around the incubating yogurt. A good friend of mine has had much success with this method. A small insulated picnic cooler is my second favorite method. First make sure your yogurt jar or container will fit inside the cooler. Then run or pour hot tap water into the cooler a few inches deep. You want it to be about half way up the sides of your yogurt jar. Test the temperature with your finger. If it is lukewarm, great! If it is too hot then add cold water to cool it down. If it is too cold, then a little hot water (even boiling water if necessary) to bring the temperature up to a nice snuggly warmth, somewhere between 85ï¿½ and 120ï¿½. Place your jar or container of prepared soy milk in the cooler and shut the lid. Allow it to sit, undisturbed, for about 4 or 5 hours. Check the yogurt. If it is thick and creamy, then it is finished. If it is still sort of thin, then it still needs to incubate longer. Pour off all of the water, which will be cool by now. Add new warm water and allow the yogurt to sit another 3 or 4 hours. It should be nice and thick and ready for refrigeration or consumption. The main advantage of this method is that it keeps the oven empty and available for other employment. If you have a gas oven with a pilot light it will usually keep the interior of the oven warm enough to incubate yogurt. Some people incubate their yogurt in a pot of warm water on top of a radiator or near a wood stove. The pot of warm water helps maintain an even temperature around the yogurt, giving you more reliable results. This is especially important if you incubate your yogurt close to draft or air conditioner. On hot days, or in warm climates, you may be able to incubate your yogurt in a warm spot on your porch or near a sunny window. Look around your house for the most likely incubation spots. After you have made your yogurt it can be used anywhere dairy yogurt or buttermilk is called for. I especially like to use soy yogurt as my buttermilk when I make biscuits or pancakes. In my experience soy yogurt is easier to make than dairy yogurt. I have had more consistent results with soy yogurt than I have with dairy yogurt. I don't know why this is. If anyone else does, please let me know. As for eating your yogurt, that is the fun part. I like mine with granola for an old health-food-freak favorite. Since most store-bought soy milk is already sweetened and flavored with vanilla, the yogurt made from it is already vanilla yogurt. It's yummy over fresh or canned fruit, on top of pies and smoothed between strawberries and shortcake. My kids prefer it mixed with a dollop of fruit sweetened jam, or used in beverages like smoothies and shakes. Soy yogurt has a fruity flavor that dairy yogurt doesn't have. I actually prefer this flavor, but some people may take a while to adjust to it. When using soy yogurt in baking, the vanilla flavoring is pretty much indistinguishable. I've thought of making chocolate soy yogurt, with chocolate soy milk but I haven't done it yet. This probably wouldn't be good in baking, but it might be perfect for lunch boxes. If anyone tries it, let me know how it turned out. Good Luck! and Happy Culturing!